Take a walk on the wild side with these excellent stuffed wild animals and plush wild animals. There are so many wild animals in the world, and while it would be great to have one of your very own, it is much wiser and safer to try a stuffed or plush re-creation of these beautiful beasts. Our stuffed wild animals and plush wild animals pages are full of the animals you might find in the jungle or at the zoo. We have plush lions, plush tigers, and plush panda bears. Oh my! You can find many stuffed Australian animals in the following pages as well. Our stuffed wild animals and plush wild animals can be found in all shapes and sizes, from large stuffed lions to our 3 inch plush clip-ons by Wildlife Artists, our selection of stuffed wild animals and plush wild animals can't be beat. 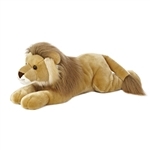 With a selection of wild animals this huge, you may want to choose a sub-category to narrow down your search results, if you have a specific plush wild animal in mind, or simply scroll through the photos below to browse through all of our stuffed wild animals and plush wild animals then click on any one that interests you to get more information. You can also call us at 866-534-6604 and one of our helpful sales associates will gladly assist you in making your decision.